Thank you for showing an interest in Redeemer Lutheran School. Redeemer has a very strong reputation for being one of the leading providers of Early Learning and primary education in the Barossa. Discover, Believe, Flourish are three words which greatly encapsulate our vision at Redeemer Lutheran School. As a learning community we strive to ‘Inspire every child to discover, believe and flourish in their world, today and tomorrow.’ As you discover and explore our website I hope you gain many insights into how these three objectives are realised throughout our many and varied school programs and extra-curricula opportunities. Our School motto “Grow Up To Christ”, comes from Ephesians 4:15 and underpins all we do as a learning community. We are proud of our long Lutheran heritage and encourage our children to live the values of courage, compassion, appreciation, justice and forgiveness, striving for quality, hope, love, humility and service. Redeemer is an exciting place to work and serve. 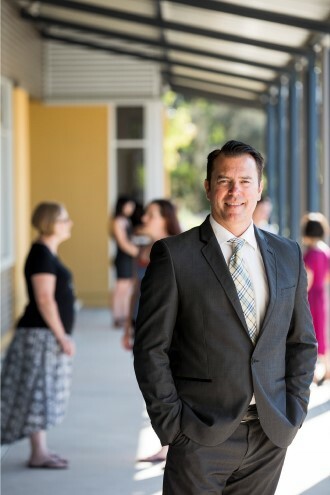 As Principal, I am proud of what our community is achieving and as we work together to build an innovative, dynamic, vibrant and truly unique Christian school. The recent launch of our new Strategic Plan, ‘Towards 2020’ demonstrates the School’s commitment to providing an exciting and 21st century learning environment for all in our community. You are invited to contact us with any questions or enquiries that you may have about learning; our International Baccalaureate Primary Years Program; our Early Learning Centre; our exciting new specialist programs or the extra support we offer our students. Our door is always open and we look forward to welcoming you to Redeemer some time soon. Read our strategic plan outline. To read our annual report please click below. See how your child can flourish in our school community with one of our Principals' Tours.